When the Peloponnesian War between Athens and Sparta came to an end in 404 BC, the victorious Spartans abandoned the Greek cities of Ionia to the Persians, who had first conquered them more than a century before. Persian control of Asia Minor was formally codified in the notorious Peace of Antalcidas, contracted between Sparta and Persia in 386 BC. The Persian Empire governed its conquered territories through local officials known as satraps, some of whom functioned as more-or-less autonomous rulers. The satrapal dynasty established under the Persian king Artaxerxes II by Hecatomnus (Hekatomnos) of Mylasa ruled much of Caria and Ionia during the fourth century BC, and the territory of Miletus fell intermittently under Hecatomnid control during this period. The Hecatomnid satrap most remembered today is Mausolus (Maussollos), the eldest son and first successor to Hecatomnus, whose elaborate tomb, the Mausoleum, was one of the Seven Wonders of the Ancient World. Both Hecatomnus (395–377 BC) and Mausolus (377–353 BC) issued coins which revived the sixth-century silver types of Miletus, featuring a lion’s head or lion protome on the obverse, along with the familiar Milesian sun/star symbol on the reverse. The issues of Hecatomnus are distinguished by the letters ΕΚΑ or Ε above the lion’s snout, while the issues of Mausolus have ΜΑ in the same location. It is commonly said that these coins were struck in Miletus itself during one of the intervals when the city was under Hecatomnid control, and this may indeed be the case. It is also possible that they represent simply a revival of Milesian types familiar to the region as a whole, and were in fact struck at Mylasa or some other Carian city. Mylasa served as the Hecatomnid capital during the reign of Hecatomnus and during the early part of the reign of Mausolus. Mausolus later moved the regional capital to Halicarnassus on the Carian coast. After Mausolus’ death in 353 his sister-wife Artemesia ruled Caria for two years, followed by Mausolus’ younger brother Hidrieus (Idrieus), who ruled from 351–344 BC. Hidrieus was succeeded briefly by his sister Ada, and then by the youngest son of Hecatomnus, Pixodarus. As part of the Achaemenid Empire, Caria in the fourth century BC was under the rule of a family of semi-independent satraps known as the Hekatomnids after the dynasty’s founder, Hekatomnos. Born in Mylasa, Hekatomnos was appointed satrap of Caria by Artaxerxes II after the fall of Tissaphernes in 392/1 BC and was later given control of Miletos in 386 BC. Interested in Hellenic culture (and possibly hedging his diplomatic bets), Hekatomnos sent his youngest son, Pixodaros, to Athens as part of a deputation; his older son, Maussolos, was bound by xenia, or guest friendship, with Agesilaus, king of Sparta. Hekatomnos died in 377/6 BC and was succeeded by Maussolos. At the time of Maussolos’ accession, Achaemenid power was weakened by the independence of Egypt and a revolt of the subject Kadusioi. As a result, the satraps of Asia Minor were able to exercise considerable independence; an opportunity of which Maussolos took full advantage. Moving the satrapal capital to Halikarnassos, he fortified the city and allowed its population to increase in size. As part of the civic building program, he constructed a massive tomb for himself near the city’s center. Known later as the Mausoleum, its size and elaborate decoration made it one of the Seven Wonders of the ancient world. In addition, Maussolos moved and refounded the Greek cities of Knidos, Erythrai, and Priene. His relations with the Persians took a downturn when he briefly joined the Great Satrap Revolt, a series of rebellions that continued to spring up in the Persian Empire throughout the 360s, all of which ultimately failed. For the remainder of his rule thereafter, Maussolos continued to act more or less independently, although he had to accept a Persian garrison at Halikarnassos. When Maussolos died in 353/2 BC, his sister-wife, Artemisia, succeeded him. Her rule, however, was short-lived, and in 351/0 BC power passed to Hidrieus, Artemisia’s brother and the second son of Hekatomnos. When Cyprus revolted following the Persian defeat against the pharaoh Nektanebo, Hidrieus was ordered to raise a force to retake the island. He complied with the command by ferrying the forces of the Athenian general Phokion and Evagoras II to Cyprus. At the same time, judging from a somewhat cryptic contemporary reference by the Athenian orator Isocrates, Hidrieus may have been engaged in clandestine diplomatic negotiations with Philip II of Macedon against Persia. Either way, by 344/3 BC, the rebellion in Cyprus was crushed and Hidrieus was dead of disease. He was succeeded by his sister, Ada. In 341/0 BC, Pixodarus, the youngest son of Hekatomnos, overthrew his sister. Such a move, possibly aided by the external support of the Persian commander of Asia Minor, Mentor of Rhodes, did little to endear the new satrap to Artaxerxes III, who had already approved Ada’s appointment. Ada, nevertheless, continued to receive support from the countryside, and still held the city of Alinda. As a result, Caria was thrown into turmoil and hesitated to support Persia with troops following the invasion of the Macedonians under Parmenion in 336 BC. Pixodaros, however, had secretly been forging diplomatic alliances with the Macedonian king. In 337 BC, he attempted a marriage between one of his daughters and the future Philip III Arridaios. Believing himself overlooked, Alexander III sent a private embassy to Halikarnassos, asking for the hand of the same princess. When word of this reached Philip II, he cancelled the Macedonian-Carian alliance. When Pixodaros died in 336/5 BC, he was succeeded by Orontobates, an otherwise unknown Persian, who apparently married the princess Pixodaros had attempted to betroth to Philip III. The fate of Orontobates is uncertain, but after Caria was conquered by Alexander III in 332 BC, the Macedonian made diplomatic overtures to Ada, and reappointed her as satrap. The weight of the [Hecatomnid] stater appears to have been based on the old Milesian standard, but so adjusted that it was now equivalent to three Attic drachmae, at which weight its accompanying drachmae were minted. The use of both Milesian types and standard leads to the conclusion that Hecatomnus controlled Miletus, though this is not recorded in any other source. This control lasted into the reign of Maussollus (377–353) since there exist a few staters with the same types, but inscribed ΜΑ(ussollus). Since, however, Maussollus is said to have made great efforts to gain Miletus, it must have slipped from his grasp very early in his reign. In addition to their Milesian-style revivals, Hecatomnus and Mausolus also struck Rhodian-standard coins that featured an obverse standing figure of Zeus Labraundos coupled with either a crouching lion or a three-quarter facing portrait of Apollo on the reverse. Hidrieus continued the Zeus/Apollo types, and introduced a new series of small silver coins that combined the three-quarter Apollo portrait on the obverse with a Milesian-style sun/star on the reverse. Note: Koray Konuk recently completed a doctoral dissertation on the coinage of the Hecatomnids (Konuk, 1998), and when that study is published it will be possible to give fuller account of the issues of Hecatomnus, Mausolus, and Hidrieus than I have provided here. Some preliminary reports of Konuk’s work have been published in analyses of the “Hecatomnus Hoard” (Ashton et al., 2002a), deposited about 390–385 BC and recovered in 1977 near the Turkish town of Söke between Miletus and Ephesus, and the “Pixodarus Hoard” (Ashton et al., 2002b), deposited about 340 BC and recovered in 1978 in the town of Bodrum near the ancient theater of Halicarnassus. Neither hoard contained any of the Milesian-style issues of Hecatomnus or Mausolus. (1a) Milesian issues of Tissaphernes? The predecessor of Hecatomnus as satrap of coastal Asia Minor was Tissaphernes, who intermittently held the Ionian Greek cities from about 413–395 BC. There is a unique 16.96 g silver coin in the British Museum which features a portrait of Tissaphernes on the obverse, and an Athens-style owl and olive branch on the reverse, with the inscription ΒΑΣ in place of the usual ΑΘΕ. This coin is illustrated among the addenda in the later editions of Barclay Head’s Guide to the Principal Coins of the Greeks (Head, 1965: 98, pl. 51.4), where Miletus is suggested as its mint, although no reasons for this assignment are given: “This is the earliest portrait of a living man to appear on any coin, being somewhat earlier than III. A. 41. [A coin which may also feature Tissaphernes and which Head tentatively assigns to Iasus about 395 BC.] It was minted, probably, at Miletus in 412 B.C. and represents Tissaphernes’ financial subsidies to the Spartans and their allies which it was stipulated were to be paid in Attic coin.... This unique piece was unearthed together with a number of ordinary Athenian coins at Karaman (ancient Laranda in Lycaonia).” G.K. Jenkins in his Ancient Greek Coins (Jenkins, 1972: 101–104) repeats the attribution of this specimen of Tissaphernes to Miletus, with no additional information provided. I know of no other published references that assign any coins of Tissaphernes to Miletus. The Milesian-style issues of Hecatomnus are known from four denominations: tridrachm staters (about 12.25 g), drachms or tetrobols (about 4.25 g), hemidrachms or diobols (about 2.10 g), and quarter drachms or obols (about 1.05 g). This is effectively the same system of division—into thirds, sixths, and twelfths—that obtained under the Lydo-Milesian standard during the Archaic period. The evidence of the Hecatomnus Hoard (Ashton et al., 2002a: 128, 137) suggests that these Milesian-style issues were struck during the later part of Hecatomnus’ reign. 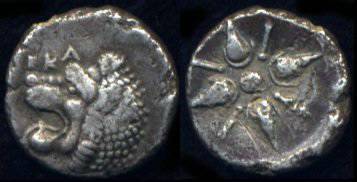 The drachm or third-stater seems to have been the most common of the four denominations. RJO 92. Silver drachm (4.01 g), about 390–377 BC. Obverse: lion’s head left, ΕΚΑ above snout. Reverse: Milesian-style sun/star design. Hidrieus continued to issue coins in the later types of his brother Mausolus, featuring a three-quarter facing head of Apollo and a standing figure of Zeus Labraundos. But Hidrieus also introduced a new type, combining the obverse three-quarter Apollo head with the reverse Milesian-style sun/star design. For the first time, lettering now appears between the rays of the sun, spelling out ΙΔΡΙ or ΙΔΡΙΕΩΣ. This type was continued under Pixodarus (341–338 BC) with reverse lettering ΠΙΞΩΔΑΡΟ, and these lettered reverses are surely related to the reverse design seen on the early Milesian inscribed bronzes, which were struck about the same time. The published examples I have seen of this type, for both Hidrieus and Pixodarus, are all trihemiobols with weights ranging from 0.71–0.88 g (Konuk, 2002: #885–889, #893–895; CNG Triton X sale, #350, 9–10 Jaunary 2007; CNG sale 228, #118, 24 February 2010). RJO 95 is clearly a hemidrachm or diobol, and may be a rare representative of that denomination. RJO 95. Silver hemidrachm (2.20 g), about 351–344 BC. Obverse: three-quarter facing head of Apollo to right. Reverse: Milesian-style sun/star design, lettering between the rays of the sun (only Ρ Σ are clearly visible).